Students on the ASD spectrum face unique challenges in understand how to interact socially in the world. Pictures and visual supports provide one way of communicating to them the expectations of appropriate social behavior. 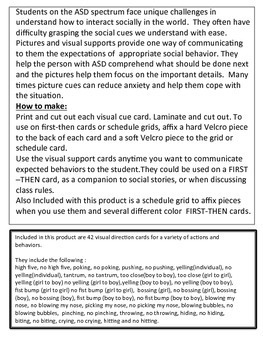 They help the person with ASD comprehend what should be done next and the pictures help them focus on the important details. Many times picture cues can reduce anxiety and help them cope with the situation. 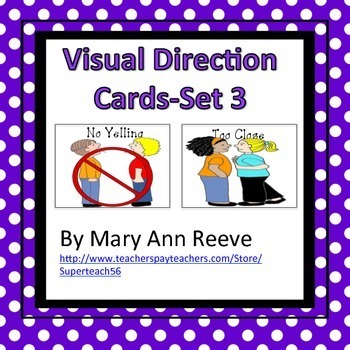 Included in this product are 42 visual direction cards for a variety of actions and behaviors. high five, no high five, poking, no poking, pushing, no pushing, yelling(individual), no yelling(individual), tantrum, no tantrum, too close(boy to boy), too close (girl to girl), yelling (girl to boy) no yelling (girl to boy),yelling (boy to boy), no yelling (boy to boy), fist bump (girl to girl) no fist bump (girl to girl), bossing (girl), no bossing (girl), bossing (boy), no bossing (boy), fist bump (boy to boy), no fist bump (boy to boy), blowing my nose, no blowing my nose, picking my nose, no picking my nose, blowing bubbles, no blowing bubbles, pinching, no pinching, throwing, no throwing, hiding, no hiding, biting, no biting, crying, no crying, hitting and no hitting. Also Included with this product is a schedule grid to affix pieces when you use them and several different color FIRST-THEN cards. 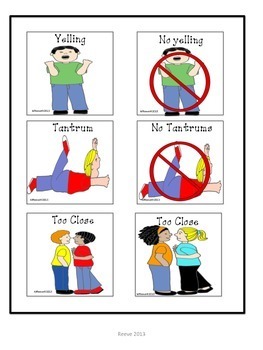 This item works great in primary or intermediate elementary classrooms and other settings where students need the support of communication strategies in activities throughout the day.